Last week, I tweeted that the fact that March 2017 was a month with five New Comic Book Days instead of four meant that this March's comics and graphic novel sales to the Direct Market would very likely be down in comparison, as it had one less Wednesday. But I also noted that January and February's performances had been just good enough that even if sales remained flat from February to March, it would represent an improvement in the overall quarter's trajectory. 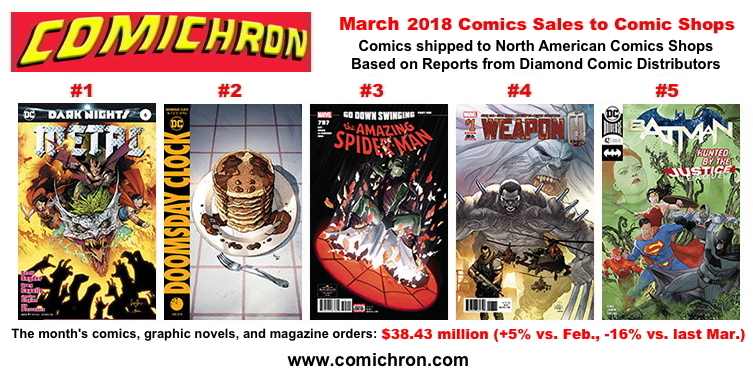 March's orders managed that feat and a little more, according to my analysis of data released today by Diamond Comic Distributors. Diamond shipped $38.48 million in comics, graphic novels, and magazines in an especially wintry March, down an ugly 16%; graphic novels were again produced the biggest shortfall, down 22% in dollars. The fifth week, however, explains more than usual this time out. Almost a hundred fewer new comics were released this March, a reduction in new-release volume of 18%; all the major publisher slates were smaller, and IDW went from 60 periodical releases in the month to 40. Graphic novel slates were also 14% smaller overall. So for the pessimists: things are still getting worse. But for the optimists: since last fall, they've been getting worse by progressively smaller amounts. There's an easy explanation for that: DC's Rebirth event made 2016's numbers very hard to hit — but by this time last year, that event had already seen its biggest numbers, and while Marvel's slowdown was underway, it had yet to see its nastiest declines. This quarter just past, DC's overall sales were up slightly year over year, with Dynamite's up a bit more; Marvel remains off year-over-year, but it's slightly outpacing the overall market. The second quarter of 2017, incidentally, saw $135.5 million in shipments; while that may seem a stretch to hit this time out, increases of $20 million from the first to the second quarter have happened this decade. Even 2017 saw $10 million more in product shipped in the second quarter than in the first. People can actually get to the stores (unless you live where I do, where we had 14" of snow on Monday) — and as DC revealed on Thursday, Action Comics #1000 will account for at least $4 million on its own in April. 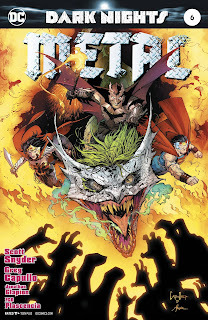 The top-sellers lists in comics, both in units and dollars, were led by Dark Nights: Metal #6 and Doomsday Clock #4, back from a one-month hiatus. 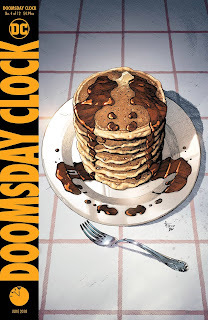 We'd noticed in our running year-to-date tally that a Metal issue had taken the top spot from Doomsday Clock, and its finale seems to have led this month. This time we added on-sale dates, making it clear that the top two books of the month actually had the smallest number of days on sale. Otherwise, performances of note include Amazing Spider-Man #797, on the way to an issue #800 which Marvel announced yesterday had garnered at least 300,000 in orders for May; Weapon H #1, which placed fourth despite a higher price and only having made one reorder list; and Image's Oblivion Song #1, which made almost every advance reorder and regular reorder list this year and placed ninth. It shows that while reorders can make a difference, it's initial orders that usually have the greater impact. By dollars, the chart doesn't look that much different, except that Weapon H's position improves and Daredevil #600 makes the list. The same chart sorted by dollars finds a regular reorder champ, the $500 Infinity Gauntlet Slipcase Set, in second, followed by a lot of hundred-dollar hardcovers. One thing I haven't explored is just how much retailer cash flow is being absorbed each month by these prestige items, as opposed to in previous years; that might be interesting. The final order estimates will be posted early next week, and will appear on this page. Set your bookmark now, and check again on Monday!